WWW, March 2009 - In the first shots of this episode, we go to the beach where another Jamaican producer rises out of the sea and explains what is going on around him, in his vision: indeed, it is time to visit Lee Perry before he burned down his Black Ark Studios. 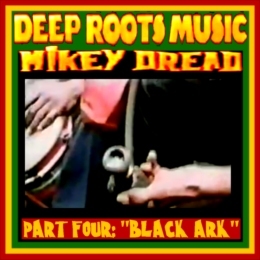 But before we go there, Mikey Dread shows us where the name Black Ark comes from. We are introduced to Marcus Garvey, the Jamaican black freedom fighter who is said to have prophesied the coming of Haile Selassie. Lee Perry is still there, too, at the sea side. He walks and talks in his own way, open for everybody's interpretation. Arguably, Lee Perry is the most remarkable person in Reggae Music. Before we meet him in his studio, as said, we are introduced to him and his family at the wonderful seaside of Jamaica. Mikey Dread continues to tell us all about Lee Perry, after which we are taken to some Idren smoking herb and chanting down Babylon: it is time for the Deep Roots series to go into yet deeper Roots of Reggae. As the chalice blaze, everyone give thanks and praise. The drums play the Nyabinghy rhythm: a heart beat named Death To Black And White Downpressors. It was Count Ossie who made the rhythm known, a rhythm very much connected to Reggae but musically not the same. It was Count Ossie who played the drums when the Ethiopian Emperor visited Jamaica: a historical event that is -needless to say- one of the most important events in the history of Jamaica. The event is extensively covered in this hour, too. And it has some pretty touching scenes: Rasta's who are being given medals by the Ethiopian Emperor, for example. Back to the Nyabinghy session. More and more reasonings, meditations, and bible chants. More clouds, too. After this foundation, we enter Black Ark Studio's where Lee Perry is ready to introduce himself and the studio he was going to burn down later. In the video, however, he takes off his shoes in a symbolic act of respect towards the works that have been produced in Black Ark. Music that stays vital until this very day. The Perry Family starts playing music as we are taken into the mixing room, finding chords as they jam on Marley's "No Woman No Cry". Lee Perry continues to talk and after a while, we find him behind the microphone where he voices a riddim, gets a box of collie, lights it up and voices some more. Suddenly, we are takes to a session with vocal group the Mighty Diamonds. The contrast is, let's say, kind of telling. When the finish their song, we are already looking at the historical sights of Haile Selassie's coronation. Mikey Dread tells us about Ethiopia and the spiritual significance, and Bob Marley's track "war", of which the text was a speech by His Majesty. We see the King of Reggae in action, performing the track in closure of yet another episode in this must-see documentary series.